Yesterday produced a topping candle in US stock indices, but was it the topping candle? The SP500 closed with a marginal 0.04% gain but advance-decline volume was 1:2 (Urban Camel). It was the 2nd-worst breadth day ever when the S&P 500 was up and so near a 52-week high (Jason Goepfert). 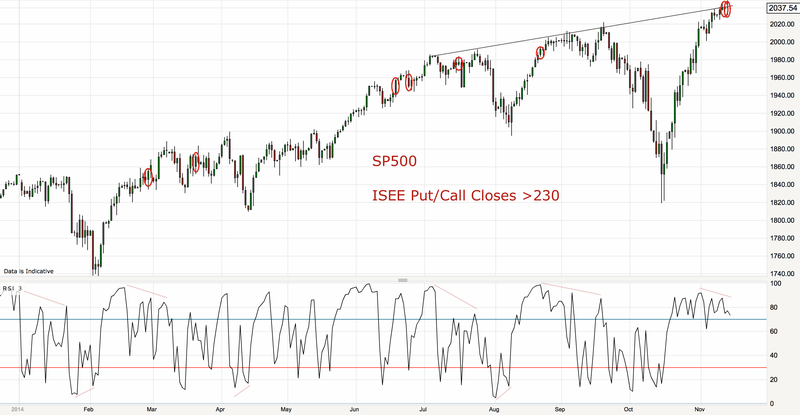 ISEE put/call closed over 230 for the second day in a row, suggesting major contrarian lop-sidedness. Previous instances in 2014 marked below reveal they occurred near tops but tended to be markers of subsequent sideways churn. That chart also shows the RSI divergence which ought to eventually lead to a leg down. Small caps and junk bonds had the biggest down days yesterday, both risk-off flags which argue a notable drop in large caps should follow sooner rather than later. European indices moved further to the precipice in European hours yesterday. At this point European indices and US small caps topped out by June 2014, and most other major global indices in September, just leaving US large caps, the Sensex and the Nikkei as the notable indices still to peak. 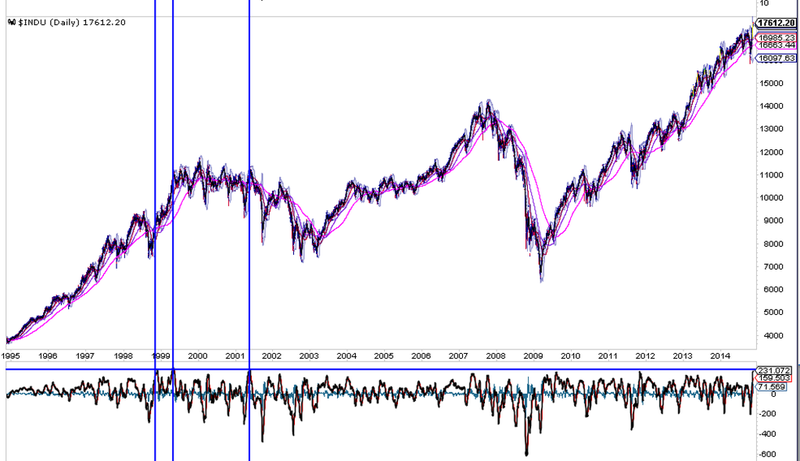 Drawing on previous major tops (2007, 2000, 1989, 1968) stock indices peaked out within 4 months of each other. Therefore, if I am correct in my assessment of where we stand then those remaining indices should top out without delay and this fits with the picture painted by most indicators: November ought to end as a down month. 1987 marked an important top. January 2011 was an early warning of an important top. 2003-2004 was ‘healthier’ froth that sometimes occurs during early bull market progress, so I suggest that cluster is less relevant here. MACD on the Dow produced a reading only seen 3 times before. All were pullback signals on the short term, but different results in the medium term. Four headwinds for US equities: a) monetary trends point to a weakening ahead in the US economy relative to Japan and the Eurozone (chart below), b) QE support has ended, c) the rising US dollar and falling oil prices have resulted in a cutting-in-half of earnings and revenue forecasts for US Q4, d) the US stock market is the most expensive in the world of all major countries (table below). If we could argue that until now a relatively stronger economy in the US coupled with the relatively most aggressive / supportive central bank made for outperformance in US stocks (shown below relative to the rest of the world equities) then that fundamental case looks to be reversing here. The case for the US dollar to reverse too is added to with the below contrarian Euro positioning and sentiment. And this would fit with a reversal in gold which looks to be basing. Here is another angle on gold that suggests we are at a similar point to the secular bottom in gold at the end of 2000. Drawing in other evidence from previous posts, there is a compelling case for a major cross-asset reversal here, out of the USD and into gold and out of equities, particularly US equities. In the very short term, yesterday’s US equities intraday reversal candle together with the Rydex spike, junk bonds drop and very precarious European indices technicals set up the potential for a follow through to the downside either today / early next week. My case is that this is the last peak in the topping process and if so we should see at least one large voluminous down-day over the next several sessions. If instead we churn sideways in a range for the remainder of November then support would grow for an end-of-year peak, but with every man and his dog expecting positive Nov/Dec seasonality to take stocks higher the stage is set for the opposite, particularly as actual geomagnetism (the underlying source of seasonality) is trending downwards currently. Thanks again John for an amazing write up. I posted the below as the last comment in the previous post and only then saw that you had created a new post. The chart below is my current count for the DJIA. The vertical red line is where I believe this expanding diagonal (megaphone) started. I’ve marked waves 1-4. The current up wave since Oct 15 in my view is only sub-wave A and therefore I’m expecting sub-wave B to come down to the mid blue line before a final sub-wave C to new ATHs. I believe sub-wave A will complete today or Monday with a small new ATH before we get the next down up waves. So although I think we will have a 1000 point drop in the DJIA and something that resembles a crash I am not expecting it to go much further. i.e. John’s call for a crash is correct in my view but the ‘crash’ will stop around the 5-6% mark rather than the 18% that John’s expecting. Jesus man, a 1000 point drop on what catalyst? I’d do an Irish jig for a 300 point pullback which would just be for what Visa added to the Dow in this parabolic rise. How on God’s earth can you make such a call?….. Thanks John. Can’t disagree with anything you say yet again. Just to follow up on a posting in the previous thread here is an article on the costs of high oil/diesel prices to gold miners. No other industry is so affected by high oil prices than gold mining. How else do people think gold miners were still profitable when gold was selling for $255 per oz in 2000?….It was because oil was still well under $20 pb. Let me get one thing straight right here. I am not suggesting that gold miners are going to flourish, unless of course the stock tanks big time, but I am suggesting that articles from the likes of Martin Armstrong suggesting that the gold miners are going to collapse and go bankrupt is farfetched. What I am suggesting is lower oil means their costs cash costs are falling dramatically and will in many cases not only offset lower gold but may even make them slightly better off than they are now especially IF we see $50pb oil which is not out of the question if deflation bites harder. 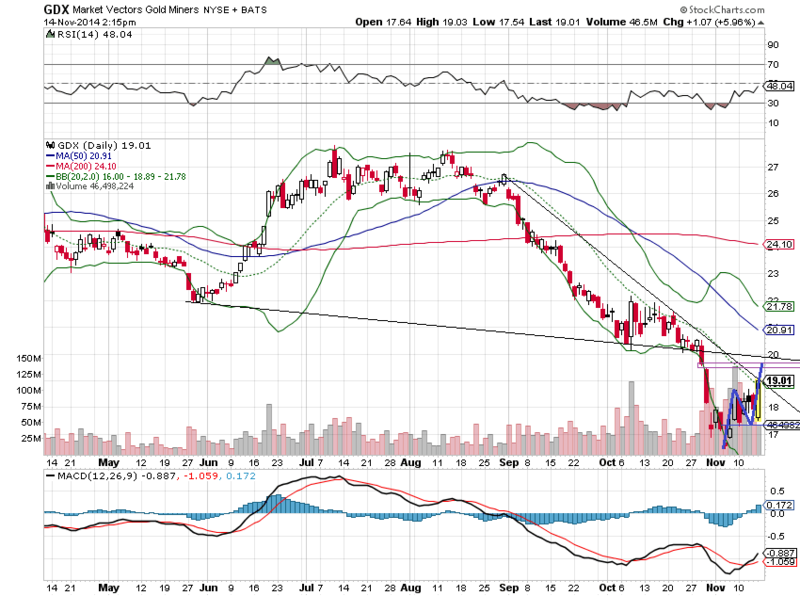 Just to add, this could emd up being a perfect storm for gold miners. If the stock markets begin to collapse along with the economy and deflation bites harder, oil could really sink and gold will IMo respond to the upside just as it did in 2000. Now that would be a triple up for.gold miners. Lower oil, lower wage costs higher gold. Ya think they wouldn’t explode? Interesting points, Allan. But in the final analysis the only real driver of the profitability of gold miners (and their stock prices) is the price of gold itself. Mate that is simply not true. Yes, obviously higher gold is the main driver but not the ONLY real driver. Gold miing is labour intensive and highly energy consuming. Reduce those two and it means more profits and we’re talking substantially higher profits. You lower the cash costs of producers by $50 per oz and in many cases you are talking easily 25% or more higher bottom lines. 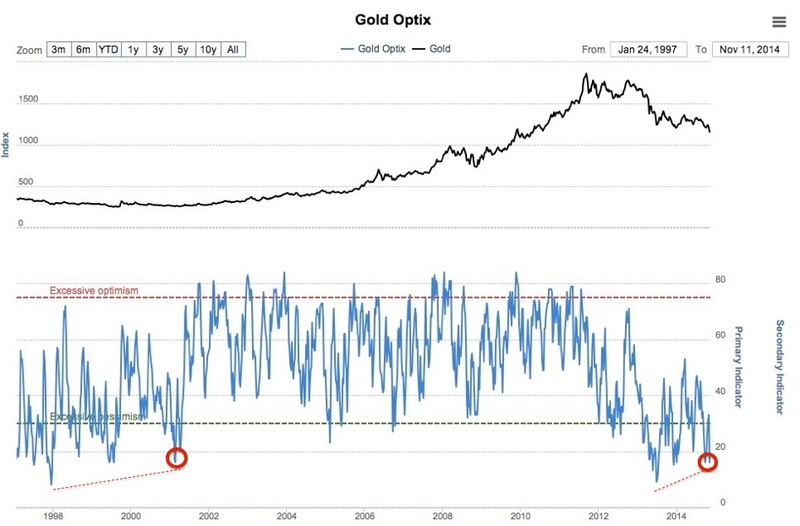 When markets collapse the first reaction is lowering gold price because of stock margin calls so investors must sell gold. So what happened in 2000 then?………a BIG hint…..the exact opposite. You’ve got it completely backwards / 180 deg wrong Le Hong…. In other words, over the past 3 years of the cyclical bear market in gold, almost all who wanted, needed, or were forced to sell gold HAVE SOLD. Educate yourself… look at the various futures gold price levels where the battles will be fought. Gold is headed much higher to fill the needs of the shorts covering their positions. This short covering will swing investor sentiment and the tide will turn to new buyers coming in to compete with the shorts making it all the more difficult for them. Wait until the Fed announces they need to print more once the market rolls over taking the dollar with it… the stock market investors will demand it. People will finally figure out the Fed is trapped. They will figure out that there are consequences for quadrupling the FRB Balance sheet. You can’t have your cake and it it too Le Hong. At least experienced investors understand this having seen it happen over and over. Stock bulls are in for yet another surprise. Allan, add in the 4th and 5th and 6th factors too for the perfect storm…. 6th….to implement QE in Europe, the ECB bids several trillion for gold. The gold price will wave as it passes by the moon in the next few years. Miners tagging along no doubt. Read this last night and made me think how much despair there is in the sector. Ive been adding on a weekly basis to long term holdings since the summer. Remember also that diesel is not necessarily always correlated with crude prices. With shipping industry having to switch to diesel increasingly due to emissions requirements, it may affect the relationship somewhat…. 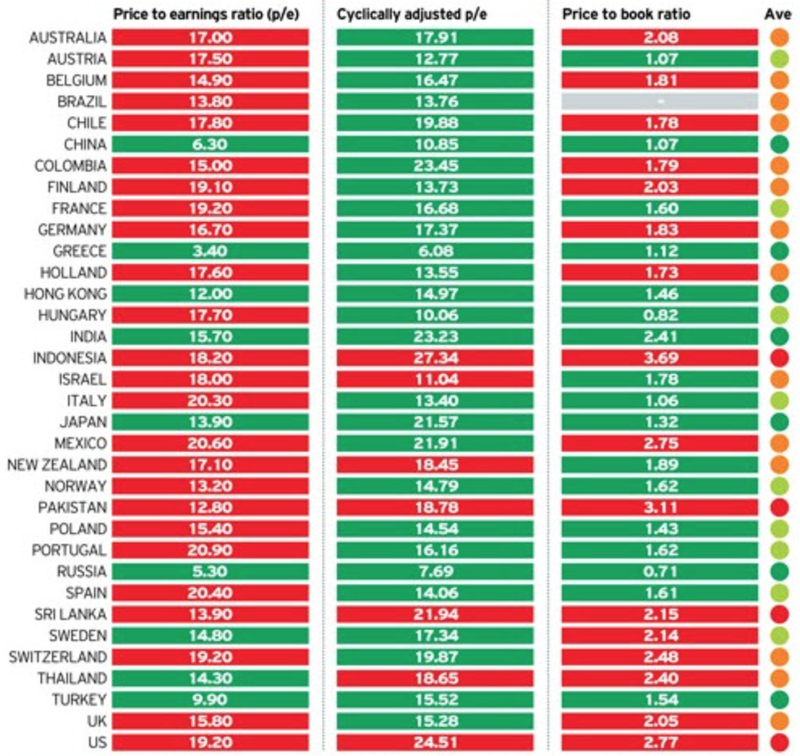 And of course the USD effect – that is why in the UK the savings for motorists is limited to around 6-7% instead of a the 25+% drop in crude prices…along with duty and other factors…. jegersmart, I have several connections within the Aussie gold mining industry and I can tell you that lower oil prices are already having am effect upon costs. You also need to keep in mind that lower deisel costs not only have direct effects ie many plants uses and operate large generators and run huge machinery. There are the indirect costs as it has an effect on everything from lower food costs to supply mining camps amd employee costs. I can tell you that already it is having an effect because one Aussie mid-tier gold producer announced Wednesday and surprised the market with a much higher profit due to lower costs. I would be very grateful if you could share the name of that miner please Allan. Not for trading purposes, but for research purposes. Thanks. Australian producer but North American listed Crocodile Gold Corp.
Allan, I can tell you that I am not disagreeing with you:) Just pointing out that diesel prices are not necessarily directly correlated with crude prices. Liquidations have already occurred in gold stocks to leverage into the absurdly overvalued stock market. Like I say, go back and check what happened in 2000 because that is exactly what happened back then. Gold stock investors sold gold and gold stocks to leverage into the dot com bubble and when the marekts tanked gold and gold stocks were the only thing left of any value because of their sell off the years before. Make no mistake, this is 2000 allover again not 2007. Agreed just think the PM sector won’t rocket higher until next May. But am watching for a MA crossover. Gold Investors: The Black Knights of Monty Python? Thank you John. Yesterday was a doji which happened too many times since the bottom, but your thorough analysis as always makes a compelling case. I still think we need that bearish reversal candle to confirm the signal, and on a Friday it’s rare we get that absent a Ukraine headline. So seems like we move sideways into tomorrow’s apogee and the reversal comes on Monday. Will look to start putting on medium term shorts by the close. The exhaustion in spx is evident and upside should be capped at 205 in the spy. GM, that was not investment advice nor am I trying to push the stock. You asked so I gave it. Just so you know I am a SH. The question is….How long before something gives?……………you can only stretch a rubber band so far.before it breaks. good call, are you long this trade? if the $ keep getting stronger we might get an asian financial crisis again. may get cheaper for the whole region, unless they jack up all their prices of course. Something peculiar has been in the works since late August. Netdania volume for gc and si have always correlated pretty well with etf and futures volume, but since late August volume on Netdania has diverged and surged to record highs. I cannot reconcile those figures and no one seems to know whats driving this. The usdjpy carry trade is also in on that as that volume is also at record highs. John, are you concerned with the poor weekly technicals in gold? It’s clearly a triple-bottom breakdown and although last week’s hammer was a bullish signal, if we close where we are (1153), it will close below the hammer and negate that signal. Despite the ugly technicals I believe it will take off once stocks fall but I see it as dependent on that. Admire your analysis, conviction and confidence John! John, gold well off lows as we speak. Crucial close today no doubt. A close unch on the week (1160) would be two consecutive hammers which are bullish. I will add to position in that scenario. John, I have Monday November 24 as the week stock market volatility picks up through December with the low coming next May. I think you will be proven correct that today the S&Ps are starting to roll over. And agree this is what it will take for gold to rise to new highs. The Fed will react once the stock market rolls over. (The dollar will be taken down with the stock market). The problem for gold bugs is that the Market will NOT be rolling over this year! Also if the dow end below 17562 it would be the first red week in over a month. Any further drop today I’m sure the powers will I step in to help out. I suppose you can only do that so many before it really breaks. Another Feels Good Friday. ES testing 2040 H&S shoulder resistance on the hourly. That needs to hold, otherwise it’s think air until 2050. I think the sell signal will appear end of day, intraday just gonna let it chop/grind/squeeze. Reviewing past price behaviour and current action, this is the most likely pattern that has high probability of occurring in SPX. Weakness Nov 17 to 20. Bullish reversal either Nov 20 or 21 and huge rally to new ATH to top out on Nov 28 Black Friday. 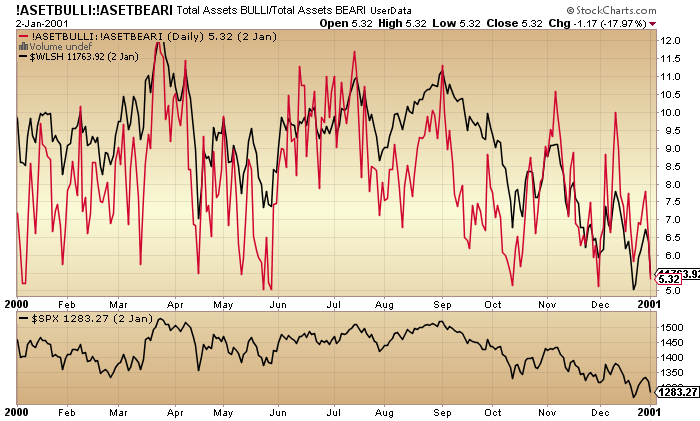 Bearish reversal on Nov 28 and weakness heading into Dec 9/10. Significant upside heading into 2015 from Dec 9/10. 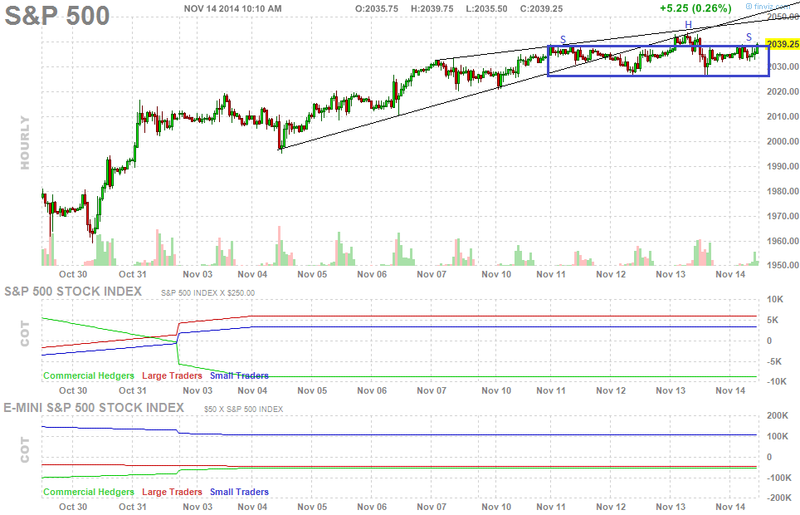 Previously I thought maybe we simply rally hard continuously from Nov 20 right up to Dec 8 or so. But considering VIX is starting to act (up) in the last couple of days after hitting ATH yesterday and it has bottomed out after about 19TD from its peak of Oct 15, the revised scenario above is most likely more accurate. Reviewing past VIX action after a huge rally into a peak and subsequent collapse (inverted V if you will), there usually is a minor (under one week) rally and then it stumbles/fizzles out before the genuine big move occurs. The weakness post Nov 28 into early Dec should result in a lower low than the Nov 20 low. 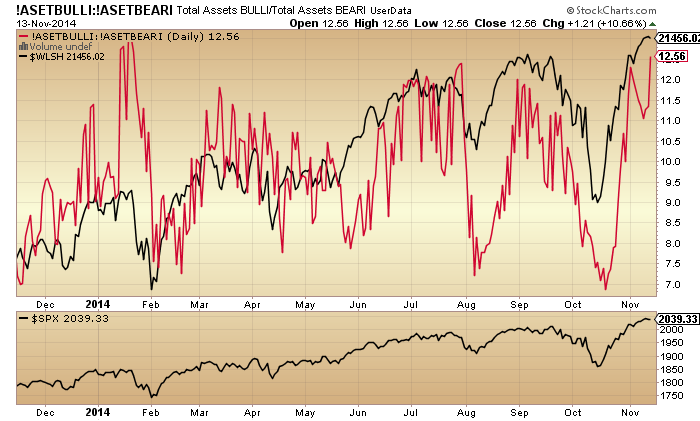 However, I caution folks to NOT get too bearish here. It will likely be the same situation again as what occurred in mid-Oct. By mid-Dec when the markets break down trendlines and support levels it will be the same group that starts ranting about pending market crash or collapse and instead that will be the exact opportunistic buying opportunity. The mid to long term trend is still bullish upwards. Stay focused. Good post, Steve T.. If the 1994, 1995 analogue is in play, prudent bearishness trading in the market until early next year when a modest pre election year rally may ensue. I say modest because of solar waning, and the fact that the market may be due for a normal correction after years of non stop gains. The sell off dip yesterday was an abc correction. This usually suggest another attempt at new highs in a 5 leg fashion. With any luck, the 5 wave advance will be a failure or maybe just peak slightly above the last high. So far the high in SP has been made on the 22nd day from the 1820ish low. Often, the SP likes to run in Fib. days, plus or minus 1 day. If that happens this time, then this 5 legger up may unfold as a 5th failure in order to keep the top within the Fibonacci time frame . Notice that the Rusty filled the gap on Wednesday dating back to July 8? I’ve been watching that thing for weeks and now it’s filled. No more reason to back trace any further. How do all you post the coming correction/pullback for weeks on end, when all we’ve done is gone straight up? None of you including John, and I say this with respect, has allowed for, nor does ANY TA allow for, central bank intervention, which is the sole energy behind this overblown parabolic move. It is NOT in their interest to let the market fall until the Republicans take office in January. Until then, it’s new highs every day for the rest of the year. This is from someone who took a beating already, but I have no choice. Price trumps all your allusions of a pullback that will never happen. IT’s all there, in the market itself…. TA ~does~ pick it up…. I’m certainly guilty of not following my own signals sometimes, yes…. But to say ANY TA doesn’t pick it up, is completely wrong…. Correct me if I’m wrong, but I, for one, can tell you that is not the case…. Just gotta follow the signals……on both sides…. Of the 100 plus comments since Nov 1st, it’s been glowing accolades of calling for an imminent sell off, and in that time we have done nothing but make new highs almost daily, thanks to BOJ and Yellen. It will take a geo-massive event to turn the market down. vinnie, I humbly suggest you google what caused the crash in 1987 and 1929. You will find no massive geo-political events, just bubbles that burst, as they always do. I have no doubt that the day will come when QE will be announced by the Fed, and the market will sell off sharpish. QE is just the latest voodoo fiat nonsense that is juicing the market, but it actually does economic harm by mis-pricing risk the world over. Weimar Germany and many others have discovered that you can’t print prosperity from thin air! You and others seem to forget that the Fed eased through the crash from 2000-03, and 2007-09, and yet still markets did their thing. They always will do. Your comment (ironically) is typical of bulls at present, and that is why (now or soon) this blog will be proven correct, and a new bear will commence. The ONLY way we do not see a new significant bear is if the ECB QEs into gold early into the decline, followed by massive QE the world over…then we’re fast-forwarding into hyperinflationary territory, and stocks will rise in nominal terms. Is Japan signalling that this is what lies ahead? I am hence keeping an open mind re a stock market bear. All in my very humble opinion of course. I was around for all you listed, I am also not a bull, I am a realist. I believe what is in front of me, not what might be. You answered your won exception, as BOJ, Yellen, and the ECB are already the ones making the dailt ATH’s. They have no reason to stop. You miss my point. Your discussion thread has been the same thing for 2 weeks, and in that 2 weeks we have gone up enormously on the Dow and SPX. How long do you go before you say, “OK we’re right now, even though it took a 1000 dow points to be right”…..
“October ended with new marginal highs on the SP500, Dow and Nasdaq. The bottom line is: my analysis doesn’t change. Here’s why. Since then, we’ve gone up how much on the Dow and SPX, please, I want you to fill in those numbers in your reply, not excuses, just the actual numbers. Another thing GM, all those sell offs were in a high interest rate environment, which we are currently at 0. There was no assumption of any kind. I was clear. Your stances for 2 weeks straight, in detail, have been about a pullback. It hasn’t happened, and there is no sign of weakness. I thought we would pullback too, but I finally caved and closed all my puts for a huge loss, still better than losing it all. There will be no pullback while the BOJ is buying with both hands, at least not until interest rates rise to 2-3% range. We haven’t even seen an “overblown parabolic” move yet. 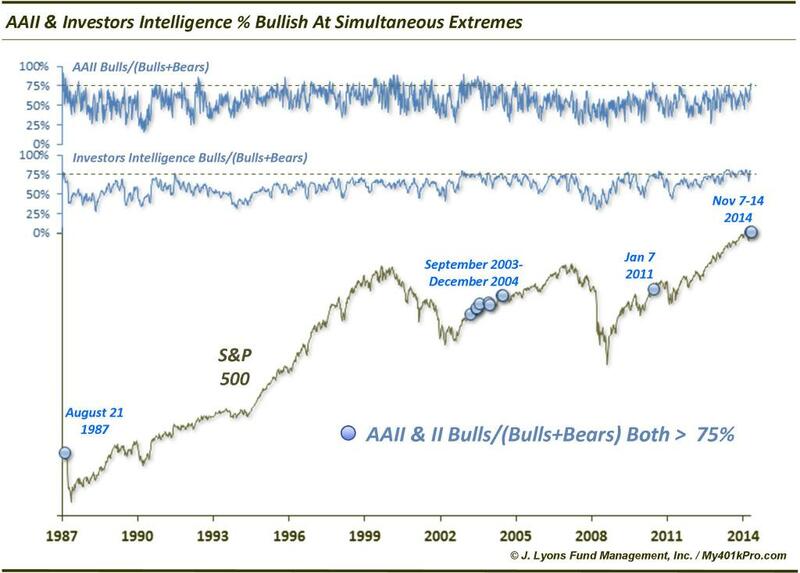 The final melt up won’t occur until retail investors are ‘all-in” and there are no more bears left. That’s when the criminal bankers will dump their overpriced stocks onto the masses in another breathtaking transfer of wealth as in 2007-08. That is all some months, if not years, away. The Nasdaq has to exceed its 2000 top first. That will be the time to go short. Until then, why keep looking for a top in the greatest bull market of all time? Also, I recommend selling short all US indexes and recent high-flyers such as GPRO and FB. what is with the continual narratives about bargain basement metals?? Totally agree. The PM sector is about to get crushed beyond anyone’s wildest imagination. As a long term stacker of gold and silver, that’s going to hurt, but I will be taking full advantage. timely, wide ranging bar reversal in gld and gdx, just in time for crucial weekly close to keep short term bullish picture intact . Gold wants to test 1200 that’s where the real battle is – is it false break on tripple bottom or mere retest of swing point. We will find out soon enough. Gold headed down to 600! Wow volatility has completely disappeared today. The biggest swing in the DJIA has been 60 points!! Line up for the last hour fireworks? bbe the first 4 are gone but the latter two have grown in size to compensate. People are you watching this? Nikkei, Cash Yen, all Yen pairs, futures… watch closely. If gold and SPX are on a see-saw, then this suggests stocks will soon play catch-up i.e. drop violently. Also, the latest sharp drop in the yen did not ignite the momo equities rocket today–a break in the usual yen-down, US stocks up linkage. That suggest a very top-heavy market that no longer responds to the momo flash-bangs that have worked for the past month. Also what’s the rush to get in at the absolute bottom? When metals actually do bottom then the upside potential will be huge. How greedy do you need to be and how foolish in the face of clear evidence that the bear in metals is deflationary and will follow any liquidity crunch further down? SPX has made a high on the 22nd day off the 1820ish low. Fib. 21 +1. S&P likes to run in Fib. time frames. But if we look at it from an astro perspective we note that Nov. 16/17th may also be very important turn date. Neptune turning direct Sunday can cause extremes in a lot of markets. I keep thinking the same thing every day for the past two weeks. One day, we will be right, but honestly, I now think more about risk-reward ratio. Even if it is the top, the maximum reward will come in the waterfall which will be 1 month from the top. Therefore, I come to the conclusion that I lose little by waiting for the top to be clear. I think we can agree that there is always a second chance rally — whether it is a couple of days in 1929, or 2 months in 1929, etc. You would be right if the current rally proves to be THE second chance. I was certainly hoping so since October. IWM or DAX might prove it so in hindsight. Unfortunately, the biggest index in the world, the SPX has proven new highs, and with each passing day, I have to assume that we will need a new second chance. You mentioned Minsky, which requires ponzi/leverage financing to unwind. That is perhaps the reason we start slow and accelerate later when margin calls appear. Moreover, given the year-end positive seasonal inflows, I just don’t see the market going down rapidly. This is not a very strong statement, as I am able to see the market going down. It is quite a useless statement for anyone with a position figuring out the next tick. It is only useful for me because I am choosing to sit out the current opportunity after huge losses, so that my next trade has a high chance to be profitable. Don’t gloat too much, Nicolas is probably suffering somewhere. GDX threatening to close above 20DMA for first time since the onslaught began in Sept. if we can hold here for the day, ABC up targets 19.6 which also coincides with the gap fill. we are setting up for something special. I am all in RWM. Hope this weekends apogee doesn’t fail to deliver a market turkey. Thank you. Actually it is more of a painful lesson for me since October. I just wish I come to the conclusion sooner rather than trying to beat the market daily without caring about the risk/reward. I only wish I kept my powder drier for better times, and then i can fight a bigger battle even when that day comes. technically, key stocks are making vertical moves up….telling u a blow off move is coming before the final top is in! pressure is on bulls to show up once again at 3pm to ramp it up. meanwhile long bonds (TLT) also looking to close above 20DMA. stars are lining up. Hi John – Looking at comparisons between the end of QE1 and QE2, we see a similar pattern is playing out here. In the first two instances, the market drifted higher and had some sideways movement for about 3 weeks after the end of QE. Currently, the market appears to be keeping that same pattern with QE3s end in October. One more week of slightly up/sideways movement and we should see the market roll over. Next Sat 11/22 is also a new moon, so this pattern fits perfectly with the lunar cycle. Gradually bigger corrections each time (17% after QE1, 21% after QE2) opens the door to waterfall declines greater than 21% starting next week and going through mid-december. Best case I think we finish the year flat, but I’m hoping for worse. 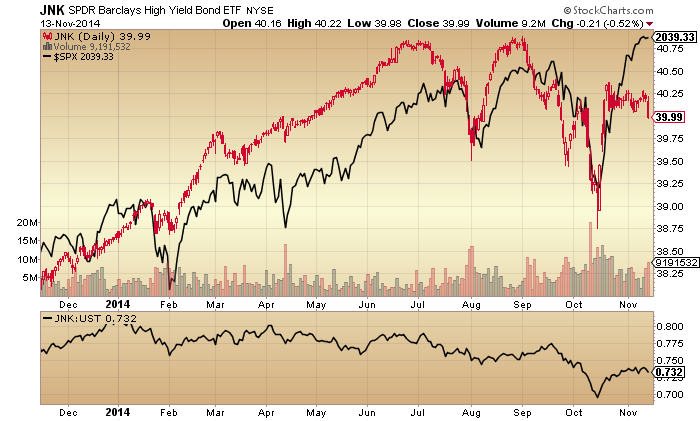 bonds, oil, high yield, dollar, gold also seem to be front running a bigger move. even the most manipulated vix is inching up. just because the indexes arent moving doesnt mean everything is ok. Breadth this week across all markets has been absolutely DISASTROUS!! I can’t EVER remember such a bad week. This thing is all but DONE!………….The fat lady is warming up in the wings. In the mean time gold and gold stocls preparing to enter stage left!! have you opened short positions yet? If not, what will be your trigger to do so? Close 1 ftse long left the others running but moved moved there stop up again. the 16 point dip down to 2030 spx was either a wave 4 OR an “a” of wave 4. Lets look at both. # 1, If it was the wave 4, then it is now going up in a wave 5. a wave 5 can ( and usually does) make a new high. Since the dip was 16 points we might expect the wave 5 to make a new high by maybe 3 to 10 points. #2, If it was the “a” wave of 4, then we are now looking at a B wave bounce that will fail and be followed by a “c” of 4 sell off that should go down to the 2020 to 2025 area, or maybe lower. It is hard to tell which it is by looking at this rally. It could actually be either case. But, both cases eventually end with a 5th wave up that “can” (and usually does) make a new high. The only exception is the 5th failure, which has not been fairly rare in this bull market. My best guess however is that this leg up today is a wave 5. And it appears to be a weak one. bot some SPY Nov/29 205 puts at 16:14 right before option market closed. looking for a turn on apogee tomorrow. if we don’t, will scale in up at 2050 in the ES. You wanna talk about candles? How about the 9th straight black candle failure on the VIX as of today’s close. We are consolidating for another ramp higher thanks to BOJ, Yellen, and the ECB, not to mention, every broker calling their clients telling them to get in. When the last retail buyer is in, maybe then, you pull back. Vinnie. I disagree with your argument about the potential reasons of the crash. However, you made some very great points, that it is impossible to dismiss the fact that the BTFD action is powerful and real, and I have also found it hard to rule our the scenario where these markets keep chugging higher during the bubble phase. With that said, we are now down to the most crucial week of November in my count, an OEX week where volatility may be taken to an extreme level, and an extremely powerful geocosmic signature of 2014. If there is a correction, it has to happen and happen now. Otherwise there will be a moon shoot to ATHs and there is not much the bears could do besides watching in horror. I think there are some Ewavers on this board have done the count similar to what i have just described. I am in the camp that believes in a reversal starting on Monday 11/17. SPX looks quite weak the past couple days, and the 2 consecutive doji pattern may have sealed the deal for the bear. However, I really like John Li’s approach, very cautious with going short and go for the kill when the reversal sign is clearly in place. This bull simply is the most powerful bull that I have ever witnessed, and I believe it doesn’t just roll over and die that easily. Let’s all buy gold and drive this baby up! We can all buy the same company with a small float. Maybe a gold stock with heavy short ratio. Let’s create a short squeeze!!! I was in a few short squeeze a few time this year. BAXS, YOD, IBIO. Thanks all, new post out.